Mainstream metro daily journalists are driven by their editors to produce a certain kind of content and that can conflict with your client’s requirements. It's not the journalist's job to promote your product or message but to provide controversy, humour, human interest or some other parochial factor that aligns with editorial policy. This differs from the opinion based columnists who are more like akin to bloggers and can make subjective claims. 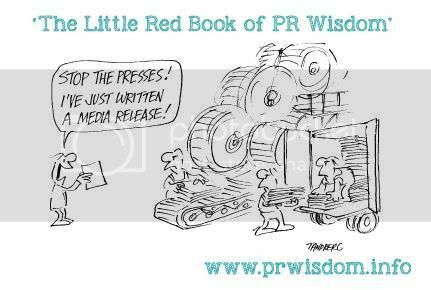 If you, as a PR consultant or in-house comms strategist, bombard a business or general news journalist with product-focused or on-message media releases, you'll find it harder and harder to get a callback. Your client may not understand their announcements have been rejected by the mainstream press, but product releases typically belong with the trades and product pages in consumer publications, unless they truly are sensational, ground-breaking world firsts. It's a better strategy to offer your favourite journalists a good story at any time, even when it doesn't apply directly to your client -- and even to offer journalists stories you've identified when they're not related to your clients at all. What we find works is to send the press release but include a cover note that explains - and paints the picture - how the content of the release could fit in a broader story of interest to their audience. For example, it might be relevant to the news of the day or it could become part of a larger feature story. Then you must convince your client that this extra work and investment is of value. That's a whole other story. To create your own online newsroom in minutes, with all the features you need to communicate directly with journalists and bloggers, visit NewsMaker.